At the beginning of each and every year I bite off more than I can chew. I set so many goals that it’s just impossible to finish them in a years time. One of the goals was to do three 30 day challenges. I was able to do two privately, but I made the decision to do the last one on Facebook. Unfortunately, I misjudged my commitment level and wasn’t able to post every day. In fact it has taken me two months to finish it, which involved posting multiple days at once. At times I wondered if I would be able to finish. There have been times in all of our lives when we’ve fallen short of the goals we’ve set. And all too well I know the feeling of disappointment when I fail to accomplish these goals. When January comes around I go crazy setting goals, but by the middle of the year my steam runs out and I find myself way behind. One of the worst emotions in my mind is disappointment. I feel it so often about myself, with who I am, and with the work I’ve done. But failing doesn’t mean I haven’t accomplished something, when we fail we learn something very important. We learn about ourselves and how much we can handle. If I had stopped when doing this challenge then that would have been failing. But because I pushed myself to finish the goal, even if it took longer than 30 days, I accomplished my goal. I have to accept the fact that even though it wasn’t done in the amount of time I originally set, I still did it. I have 30 posts that have all been shared on Facebook. By completing our goals and not stopping when we feel like it, we learn about ourselves and about commitment. So next time a goal is set and not met we can remember how we overcame last time and move past it. We’ll never grow if we make the same mistakes over and over, we have to learn and apply what we learned. Forget the disappointment, we’ve all had that feeling. If we’re crippled by that feeling we will never accomplish anything. Move past it! Keep pushing away at that goal, and eventually you’ll be standing at the finish line wondering how in the world you got there. Thinking to ourselves that if we had stopped when it was hard we would have never gotten there. Keep dreaming and keep pushing, it’s going to take a lot of work. But you’ll be so glad you didn’t stop. Join me as I start a 30 Day Facebook Challenge. Each day, starting today I will post and answer a question or share something with you, relating to photography and myself. If any of the challenges apply to yourself go ahead and comment your answer, I’d love to hear from you. At 15 years old I act more like 20 and I think I should be living in the victorian timeframe. I am the youngest of two and my family are full time servants for our Dalmatian. My taste in music ranges from Hans Zimmer to Billy Idol to Mozart. I lived on the second tallest hill in town for 14 years, the first tallest being the dump. I will wear anything from vintage clothing to sweats and my choice of shoes are Harley Davidson boots, Vans, or none at all. The only TV show I’ve ever cried during is Downton Abby and I can watch the Star Trek reboots over and over. I collect everything from snow globes to composition notebooks to vintage cameras. Every morning starts with a cup of hot chocolate and I live for gray skies and rainy days. My mom often has to tell me to stop reading and no matter how hard it is I can’t go long without dancing. I always wear a key around my neck and I’m never without my chapstick. Winter is my season and I have a snowy tree painted on my bedroom wall. I always carry my camera with me and I am known as a pen thief in my family. Lilies are my flowers of choice and some people know me as Atlantis. I’m passionate about a lot of things and animals have a special place in my heart. I never want to give up my dreams. Today’s questions is why do I do photography? 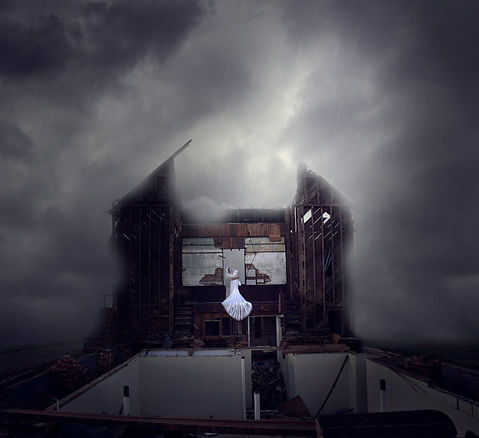 When I started photography it was mostly because I wanted to be like Brooke Shaden (more on that on day 6) The first couple of years I didn’t have a real reason for doing photography, I just did. But I’ve come to realize that I do it for a much bigger reason. Fine Art Photography is a way of spilling emotions into a single frame. I create images to share stories and worlds that otherwise would be stuck inside my head. It’s a way of being venerable without having to say anything, of creating a completely different person in which I can become. I do photography to express my emotions and little parts of myself. I’m able to create something that has never before been seen in the world, it’s almost like a super power. And to be honest, I do it because I love it. I shot my first “real” image on October 13, 2013. It was one of the most amazing and memorable days of my life. 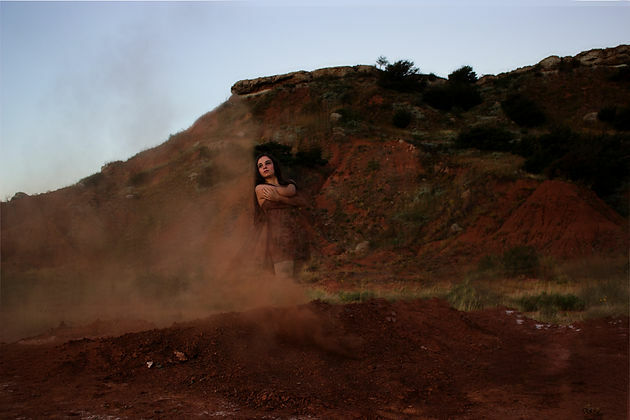 I shot it at the Gloss Mountains in Oklahoma at sunup using my sister as my model. The image below is the final product. It’s rough but it started my photography career. Follow the link below to a blog post I wrote about the image. I shoot with the Canon Rebel T3i. I got the camera in 2013 and have used it ever since. I am currently in the process of saving up for a new one. Today’s question is where do I get my costumes? Over the years since I’ve started photography I’ve grown to have quite a collection of costumes and the one place that I always go back to for more is Goodwill. They always have an amazing selection and get new stuff constantly, they are my number one place to find costumes. I’m sorry that I’ve missed a couple days on the 30-Day Challenge, allow me to catch up today. Here’s the question for day 6. How did I find out about photography? About four years ago my dance studio was having recital pictures taken at a local photography studio (Muncy Photography), I was 11 at the time and got bored easily, especially waiting between shoots. In the back of the studio, the photographer was running a live workshop on her computer and my friends and I sat down to watch it. 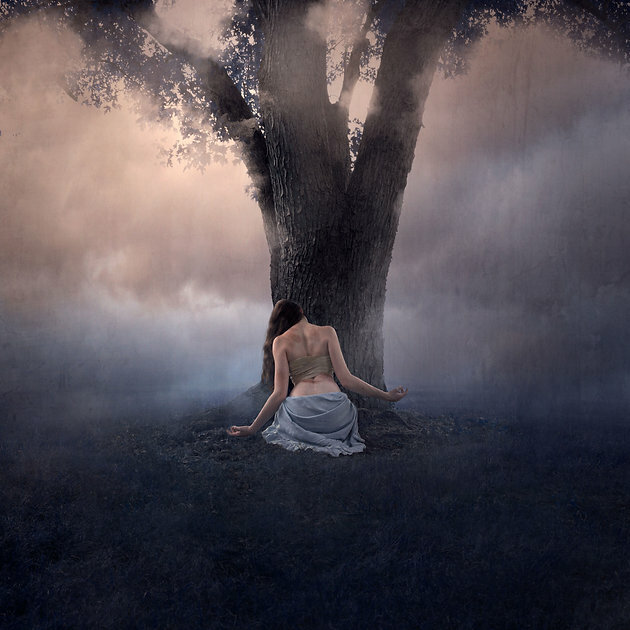 The workshop was Fine Art Photography by Brooke Shaden streaming in from CreativeLive. I was instantly hooked. I saw what she could create and desperately wanted to be able to do it too. That is how I found out about photography. The question for today is what is my biggest dream? Tough question. I’ve had so many dreams over the years, including owning a firetruck, that it will be hard to narrow it down to one. Let’s see what I can do. My biggest dream, in photography at least, is to be able to connect with people on a deeper level than just “I like that picture”. In a world so heavily saturated with images if something doesn’t catch your eye right off the bat, it is easy to move on from the picture without a second glance. My goal is to create images that people with stop and stare at for longer than a minute, for them to be able to feel attached to the characters and the story. I would have to say my biggest dream is to connect with people I’ve never met before through the image I create. What is a book that I love and feel inspired by? I would have to say that my all time favorite book is Jane Eyre by Charlotte Brontë. A romance at its core, the gothic novel is filled with complex characters with what might be a cliché plot if not for the influx of mystery and suspense. The captivating novel will have you turning page after page after page. A great book to curl up with on a rainy day. Today’s question is…What are some things that I enjoy? Among the many things that I enjoy are reading, dancing, and writing. I’m working on reading 100 books this year and have read over 50 already, I’ve danced since I was three years old and am interested in becoming a choreographer, and as for writing, I’m currently working on several novels. Todays challenge is to share a photoshoot story. In the town where I live there was a dilapidated church. It was stunning and kept calling for me to do a photoshoot in it. So I finally decided to. Decked out in a wedding dress that I got from Goodwill, I clambered up the brick stairs leading into the church. I positioned myself in the middle of the stage where the pastor would have stood. Three of the four walls had collapsed revealing the basement and leaving the last wall open to the world. Said wall faced the road and I thought that if we got up early enough the road wouldn’t be that busy, but I was wrong. The street was packed with morning traffic! You’ve probably never stood in a wedding dress in a rundown church next to a busy road before, but if you have you know that the whole experience is both thrilling and terrifying. There were a lot of honks and stares. And if the whole thing wasn’t enough I had to go back a couple days later and do it again because I didn’t get the focus right the first time. I’ve actually never finished the image, although I did take one in the basement that did turn out. However, the main image never turned out the way I wanted to. Maybe one day I’ll revisit it and see if I can fix it up. The question for today is what is my favorite photoshoot location? About 89.5% of my images are shot at my house, well okay maybe 95%. We have 11 acres of thick forest and it’s absolutely beautiful–the perfect place for taking pictures. But it’s not my favorite place to shoot. I love to shoot anywhere at anytime, but my favorite place to take pictures has to locations away from home. I’ve shot in graveyards and on islands, stood in broken churches, and climbed on public walls. There’s always something exciting about being stared at as you walk down the street in capes and nightgowns. Today the challenge is to share my favorite quote. With so many amazing quotes in the world it is extremely difficult to pick a favorite. So here are my top three favorite quotes. The questions for today is what are some goals for my photography? I have a lot of goals, as I mentioned on Day 7, but here is a short list of goals I have for my photography. What are some goals that you have for your life? The challenge for today is to share a future photo idea. There are so many ideas jumbled up in my brain, I could talk about the porcelain doll idea, or the living wall. But I will stick to a relatively simple one that involves dancers. The other day my mom and sister and I were at a coffee shop tossing around some ideas when my sister suggested I get together some of my dance friends one day and take 12 pictures, one to represent each month of the year to put into a calendar. At first I was a little hesitant because it didn’t seem very Fine Art, but after I thought about it for a while I began to love the idea. Why just do one day of photoshoots? I could make them as elaborate and as complicated as I wanted and shoot them over the course of a couple months. The idea is tumbling around my mind, I’m ready to get it out there and start taking those pictures! I will let all of you guys know how this idea comes along and the progress I’m making on it in later posts. Inspiration is everywhere, in books, forests, people, buildings. You just have to be willing to look to for it. But for me personally, I find inspiration in objects. From tea cups to giant trunks, tables to broken lightbulbs. There are stories within everything around us and if we can just look at them in a different light and in a different way we might be able to draw the inspiration out of objects. From those objects entire stories can come forth placing themselves in my mind, demanding to be created. Once you figure out what inspires you, surround yourself in whatever that is and you will never be lacking in ideas. The challenge for today is to share my favorite image. When I originally wrote this post I had two very different images in mind that were my favorites, but since then I’ve created Vulnus which so far is my favorite. It’s hard to go through each image I’ve ever created and pick a favorite. It’s like choosing a favorite child I imagine. But the image below is definitely my favorite. For me the thing that makes it stand out from the others I’ve created is the colors. I was able to pull colors from the clouds in the image and bring them to life, something I’ve always found very hard to do. Editing the image was very enjoyable as was the shooting of it, although I didn’t love kneeling among all the ants, it just seemed natural. I was no longer telling the picture what to look like, but it guided me towards which colors I should use. It came to life without me and that is something truly amazing. I hope to create images that I love this much in the future. The question for today is what is my favorite social media site? With so many social platforms in the world today it can be crazy trying to succeed with all of them. Everyone prefers one above the rest, it could be Facebook, Snapchat, Flickr, Twitter, etc. For me, my favorite is Instagram. The perfect place to display images, I enjoy posting to Instagram the most it gives me the ability to do visuals as well as text, the perfect combination for me. What is your favorite social media site? The challenge for today is to share a little bit about my idea notebook. Ideas strike at the most random times, on a trip, in the shower, scrolling through Pinterest, ideas hit whenever they want to. And when they do they send us scrambling for a piece of paper and pen. We scribble the idea down, but more often than not we lose that small piece of paper and the idea. This has happened to me multiple times, which led me to the idea notebook. 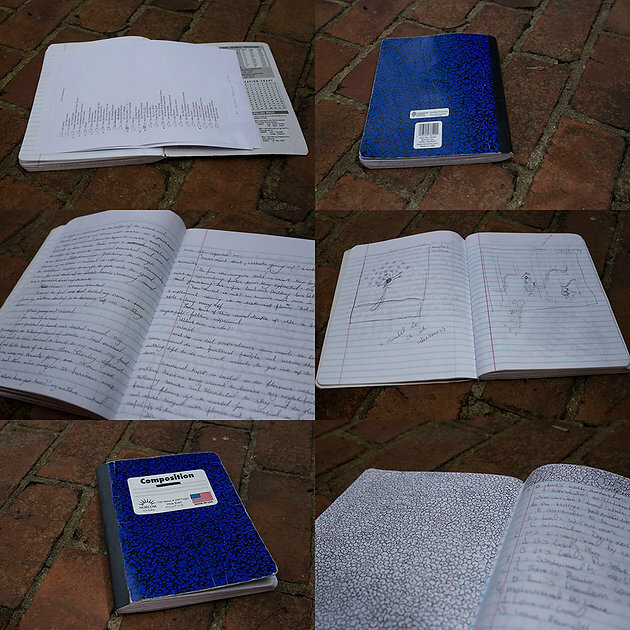 In it’s most basic form the notebook is literally a place in which you can write anything. But unlike that random piece of paper you reach for, all your ideas, doodles, to do’s, goals and random thoughts, are all in one place. You can flip through them as much as you would like and it is nearly impossible to misplace. For me personally the notebook is a simple blue composition notebook that’s almost completely used up and looks the part. My pages are filled with scribbles in black ink only, plain and simple but using just black ink makes it feel special. Inside the notebook the notes are a complete mess, some run on for a couple of pages in very small handwriting that fits inside the lines. Then on others my handwriting looks like chicken scratch where I completely ignore the lines of the pages. It’s messy, it’s crazy, but it’s totally me. For some people the messiness would drive them up a wall, this notebook is a place to write down your ideas, tailor it to your likes and dislikes. You would like to have a bright pink notebook that had a hardcover? Go for it. You want to use a yellow legal pad with a blue ink pen? Why no? Use something you can be yourself in. The images below are of my notebook. Today’s challenge is to share 3 of my favorite photographers, which is hard because there are so many amazing ones out there. 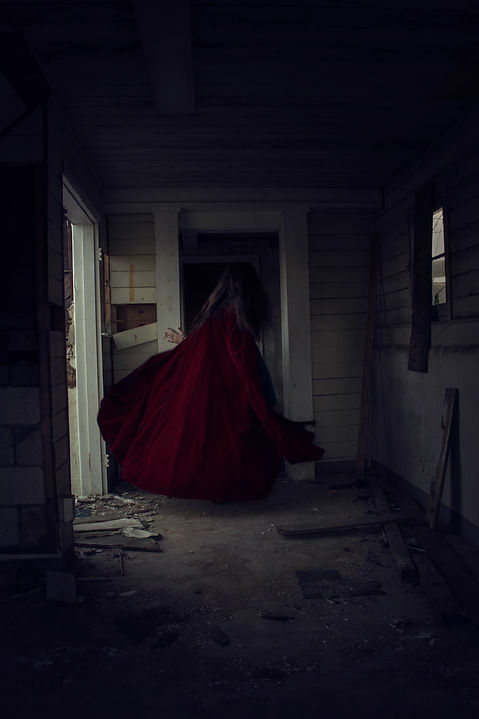 My all time favorite photographer is Brooke Shaden, I’ve mentioned her already multiple times, but I believe she deserves all the mentioning possible. I discovered her in 2013 and was instantly captivated by her detailed and magical images. The stories she is able to bring to life are so beautifully rich and meaningful, allowing people to connect with them in their own way. Everything she does is so captivatingly whimsical. Bella Kotak’s images are fairytales in themselves, mixing beautiful pixie like girls in with the most vibrant flowers. She effortlessly creates worlds in which we can step into while viewing her work. Graceful figures adorn her pictures and with each image we glimpse a world so full of life and color it is like looking into an eternal spring. And last but not least, Kindra Nikole. Her images are absolutely stunning, with vibrant colors and stories that flow off of them. Dream like images capture stories and inspiration and mix them with forest backgrounds and beautiful backgrounds. Her style is absolutely unique and stands out among the best. Her colors are rich and alive pulling forth stories and meaning. Today’s question, which is more of a get to know me questions, is what is my favorite movie? The nerd side of me really would like to say Spiderman: Homecoming (how can you go wrong with Marvel? ), but I must say from the first moment I saw it on one of my favorites has been Inception. The visuals are absolutely stunning and captivating. The way the characters create their own worlds is so beautiful and something I strive to do in my photography. If you have not seen the movie I would highly suggest it. The question for today is what lens do I use? Just recently I switched from the Canon 18-55mm lens to the Sigma Art 24-105mm lens. The first four years of my photography was shot on the 18-55mm making it very special to me, but the Sigma Art lens passes by it completely! I absolutely love the 24-105mm and if you are in the market for a new lens I would suggest you look into it. If you’re a photographer share in the comments what lens you use, I would love to hear! The question for today is what is my favorite prop? There are tons of props I love to use, from ropes to ladders to lanterns and beyond. But I have to say I absolutely love working with books. The idea and theme behind what a book symbolises opens up entire worlds to work within. There are not that many images of mine that have books in them, in fact I can only name three that I’ve ever done. But in the future I would love to work more within the realm of books and dive into their covers and explore their stories. Today’s challenge is to share my biggest fear. There are so many different things I fear from tornadoes to sharks, but those are just trivial fears. For me I fear the most that I won’t fulfill the dreams I had when I was younger. That somehow along the journey of my life I’ll take the wrong turn and disappoint the person I used to be. Along the way of growing up you hit this point where reality sadly settles in and the fantasies you had when you were younger seem way to high to ever reach. I’ve hit that point, but I don’t want to stop there. I want to be able to look at the seemingly ridiculous dreams I had and say “You know what, I don’t care what the world says is impossible I’m going to do it anyway.” I want the courage to accomplish what I’m afraid to lose. The challenge for today is to share a song that inspires me. Music is something that I have a great passion for and I love everything from Christian rap, soundtracks, and even 80’s. But a song that never fails in inspiring me is “Saturn” by Sleeping At Last (click Here to listen to it). It is by far my favorite song. The challenge for today is to share an image I’ve never shared before. Truthfully I have no idea why I’ve never shared this image, it’s one of my favorites but just missed out on being posted after I completed it. Atelophobia was shot about a year ago during a writing convention I was attending with my family. 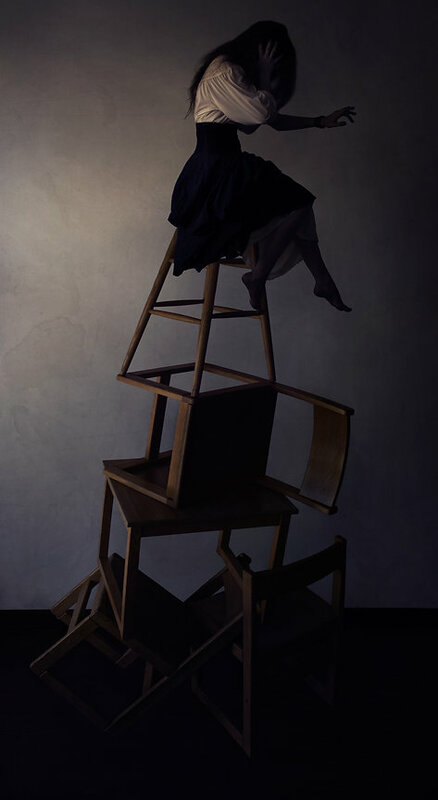 I had a lot of fun stacking chairs on top of each other and then later in photoshop sticking myself up on top of the stack. It had been one of the smoothest edits to date and I’m glad I’m finally getting it out in the open. Today the question is what do I enjoy about photography? I love feeling the thrill of jumping around in a nightgown, while capturing shot after shot, that later becomes a story I will share with others. I love pulling all the images into photoshop and pushing and prodding until I see the final project emerge from a blank slate. I love the stories that are built into the images that I get to be a part of. I love creating other worlds in which I can live for a short period of time, and others can connect to. I love being able to tell stories! Today’s question is what does Fine Art Photography mean to me? When you search fine art photography on google you come up black and white images, nature, nudes, even weddings, as well as a few of Brooke Shaden’s images. It seems that everyone has a different definition of what fine art is. To me fine art is a story, more so than a picture. These images communicate stories that people connect with in different ways than the person sitting right next to them. Fine Art is a way of communicating with words through a picture. They say a “picture is worth a thousand words” and in this style is truly is. Scenes of fairytales and ethereal moments stare back at you, and for a brief moment you see yourself in another world as another person living their life. That’s what Fine Art Photography is to me. The challenge for today is to describe my photo process. The moment I get an idea I instantly write it down. I have two notebook that I use, an idea notebook, and a photoshoot notebook. In the photo-shoot notebook I draw a sketch of the image and describe the technical aspects. I will list what costumes the model will wear, props that will be used, and things that I will need for the shoot. After that list I will describe what the story of this character is. What she/he is doing in the world that is being created, what is happening in that moment, and what will happen afterwards. Then after that process, on the next page I write down the subtext, or what the real meaning of the image is to me. I will add at the end of this process any details I would like to add to the image. When I have the image developed and ready to shoot I’ll usually wait for an overcast day or get up early to shoot. I’m usually by myself when I shoot. This allows me time to really feel what the character is like, and to have the freedom to explore the location. I shoot the pose as well as extra hair flips and dress movement that I might need later. Following that I shoot a blank shot, which is just an image of the background without any model or props in it, which might come in handy when editing. After I have all the images I could possibly need I download them to my hard drive and go through them. I choose my my favorite photos which I then open in photoshop. Then begins the process of editing the image. I start with compositing the different elements together like hair flips or levitating props. When the compositing is complete the fun really starts. I begin editing the lighting and colors, tweaking the image here and there, until I feel like I’ve brought out the image I had written in my notebook. Sometimes the image turns out totally different than I pictured. The entire editing process can take many hours with over a hundred of layers. Finally, at the end of this process I post the image to Instagram, Facebook and Twitter, allowing others to share the story with me. The question for today is what have I learned from this challenge? Wow, I’ve learned so much. For instance, I need to be more prepared before I do a 30 day challenge. I need to fully commit myself to it and not waver from the goals I set. I learned that I’m super wordy when I want to be and that I enjoy posting to Facebook more often. I’ve learned that stress can drive me bonkers and I just need to stick to my plan and push through. But mostly, I’ve learned that when I feel like giving up I shouldn’t because even if it takes longer than I planned I will eventually complete my goals, pushing me closer to where I want to be in my life. Today is the last day of my 30 day photo challenge, I must say I am quite relieved. These last two months I’ve struggled with it a lot and in my newest blog post I’ll talk a little bit about it. But in the mean time here is the last question. Why the name Strength Of Atlantis? I’ve actually wondered this myself. Originally the name was going to be “Heart Of Atlantis” and I would only send out an email or blog every month until I was old enough to get a blog. But somewhere in these past three years I changed it to Strength Of Atlantis and I’ve never known why. A very long time ago I got this ring with “Strength” engraved on the side. I’ve worn it since then, and for years this ring has been a constant reminder to have strength in everything I do. We all want to have strength, to be able to face the challenges of each day without backing down and giving up. The definition of strength is “the quality or state of being strong,” as well as “the capacity of an object to withstand a great force.” To me strength is to withstand all the negativity in the world and still hold onto what you believe in. Originally when I created Strength Of Atlantis I was just putting two of my favorite words together. But in my mind the name of my business should have a deeper meaning than that. With that in mind I began looking at the meaning behind Strength of Atlantis. Atlantis was a mythical city, that was beautiful, prosperous, and that sank into the ocean to avoid being corrupted by the world. A fairytale and fantasy for sure. Strength of a Fairytale. With this new meaning behind the words I found the meaning for the name of my business. Being able to create mythical characters that are strong in their own way. These characters will be able to withstand the world through fairytales and fantasies. “Strength Of Atlantis” is going to be able to add the strength of a dab of magic to the ordinary, a whisper of an ethereal character running through a fanciful land. I create strength through fairytales and beckon others to join me. Thank you all so much for your support of this 30 day challenge, I hope you enjoyed the end product as much as I enjoyed finally completing it. Have a wonderful day and I promise that next time I will keep my blog post a little shorter!